Our guest today is Chris Barton, author of the New York Times bestseller Shark vs. Train, the Sibert Honor-winning title The Day-Glo Brothers, and (coming soon from Eerdmans!) 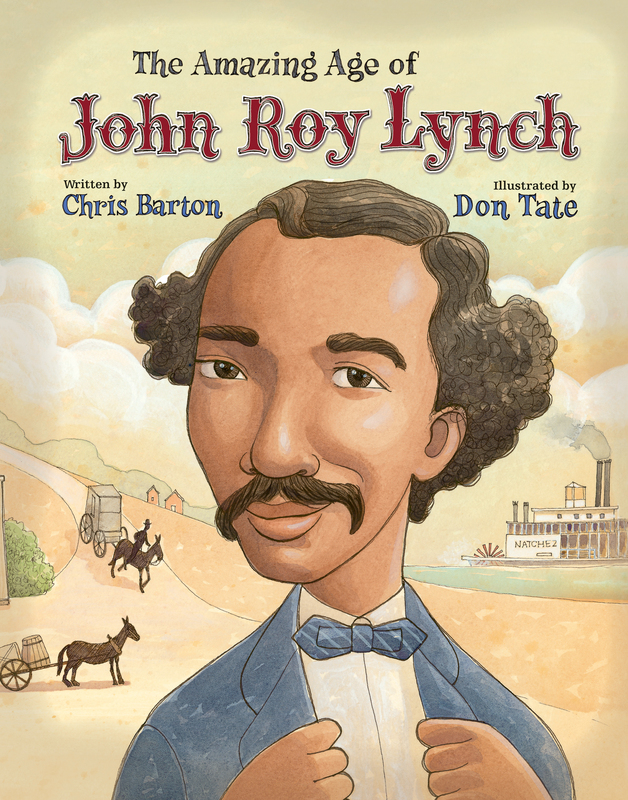 The Amazing Age of John Roy Lynch, a new picture book biography of one of the nation’s first black congressmen. The title The Amazing Age of John Roy Lynch was there in the very first partial draft, dated January 16, 2007, and it’s never been called anything else. It refers to John Roy Lynch’s impressive accomplishments as a youth, considering he was elected as a Mississippi legislator the year he turned 22 and then elected to the U.S. House of Representatives just three years later, a mere decade after having been an enslaved teenager. The fact that such a transformation in one person’s life was even possible — and that this particular transformation was possible only during this one period in American history — makes Reconstruction itself an astonishing era. All of the above is true, and familiarity with Reconstruction is essential to understanding why the civil rights movement occurred a century after the Civil War rather than immediately afterward — and yet so many Americans young and old would have a difficult time recounting vital details about Reconstruction or even explaining what was significant about it. That, to me, is amazing. It’s sad, and it’s unfortunate, but it is undeniably amazing. Why did you choose to publish with Eerdmans? Because of Anita Eerdmans, author Jen Bryant, and illustrator Melissa Sweet. And art director Gayle Brown, though I didn’t know it at the time. I met Anita at the Texas Library Association conference — she was working the Eerdmans booth — in 2005, years before my first book, The Day-Glo Brothers, was out. I liked her a lot, and I always looked forward to visiting with Anita at these sorts of events. It was a personal connection, more so than a case of me seeing Eerdmans as a likely publisher for any of my manuscripts. I knew Eerdmans as a publisher of religious books, a genre I wasn’t working in. Another option that comes to mind for John Roy Lynch is Eerdmans — have you seen their William Carlos Williams bio, River of Words, that won the Caldecott Honor? Man, oh, man! I think I’ve visited with Anita Eerdmans at more conferences than I have anyone else, and I always come away thinking how much I’d like to work with them. Until she tells me otherwise, I’ll assume the feeling is mutual. That thoughtful gesture by Anita led to her, Gayle, and Erin giving a lot of attention to us working together on my John Roy Lynch book, and Eerdmans offered that August to publish it. That even though there were zero African-Americans who represented former Confederate states in the U.S. Congress between 1902 and 1972, there had been sixteen between 1870 and 1877. Something remarkable began happening during the five years after the end of the Civil War — and then stopped happening. Once you know that, I can’t imagine not wondering “Why?” But not enough people know it. If you had to summarize your book in ten words or fewer, what would those words be? How did your collaboration with Don Tate materialize, and what’s your process for working together? So, that January 16, 2007 draft that I mentioned earlier? Here’s an email I sent that day to my two manuscript critique partners — Julie Lake and Don Tate. I’ve attached what I’ve written so far for my current picture book biography — it takes my subject’s story up to 1869, when he was appointed justice of the peace in Natchez, Mississippi. I still need to cover the next 3-4 years, when he was elected Mississippi’s Speaker of the House and elected to the U.S. Congress. Don was involved in this book almost from the very beginning — but as a fellow writer, not as an illustrator. When I was at the American Library Association conference in June 2010 to receive the Sibert Honor for The Day-Glo Brothers, Anita invited me to join Eerdmans at their table at the Newbery-Caldecott Banquet. I got to sit next to Gayle, and I suggested to her that Don Tate would be a great candidate to illustrate The Amazing Age of John Roy Lynch. I’m so glad she agreed. As for our process of working together — both on this book, and on our 2016 collaboration for Charlesbridge, Whoosh! Lonnie Johnson’s Super Stream of Ideas — even though Don and I both live in Austin, I’ve given him a lot of space. When he began working on the illustrations, I shared my research materials with him. And from time to time Don would ask what some detail from my text would look like — John Roy’s job as “pantryman on board the Altamont, a Union transport steamer,” for instance — which forced me to consider my manuscript in a way I hadn’t before, and that made for a better book. But Don Tate had already made great art for a lot of books without having the authors looking over his shoulder, and I didn’t want to mess with a process that had clearly worked so well. The results speak for themselves: Don has made The Amazing Age of John Roy Lynch a beautiful book. Want to see more of The Amazing Age of John Roy Lynch? Check out our Eerdlings sneak peek! You can also visit Chris Barton’s author website and blog, or follow him on Twitter.